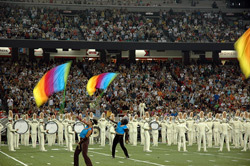 Drum Corps International returned this summer to the Georgia Dome in Atlanta on July 26 for the annual DCI Southeastern Championship. Fans packed the stands while corps warmed up throughout the day in the parking lot, finally heading inside the roofed stadium to take the field for their competitive performances. In the end, the Blue Devils continued their impressive season-long undefeated streak, edging the Cavaliers and the Phantom Regiment who took second and third place respectively. Check out this photo gallery of scenes from the event. Photos by Johnny Gilbert, David Rhodenbaugh.